In late May and through June this year, there has been a wave of fierce class struggle in the Bangladesh garment industry. To illustrate the scale of events: around 4000 factories in Dhaka went on wildcat strike, 16 factories were burnt down by strikers and hundreds more ransacked and looted, pitched battles were fought with cops and private security forces in workplaces and workers' neighbourhoods, main roads were blocked. Casualties include 3 workers shot dead , thousands injured, several thousand jailed. The Government eventually felt compelled to bring in the Army to restore 'order'. It was a working class revolt that spread beyond the workplace and generalised to involve the wider working class community. At present (early July) the struggle continues in the garment zones on a lesser scale. The revolt began on Saturday 20th May in Sripur in the Gazipour district of Dhaka. 1,000 garment workers gathered at FS Sweater Factory, refusing to work until 3 arrested fellow workers were released from custody. The factory bosses locked the striking workers in the factory, cutting the power and water supplies. Eventually, the sweltering heat proved too much and by 11 am the workers fought their way out, then gathered on the Dhaka-Mymensingh highway. Now joined by locals, they barricaded the highway for 6 hours and fought pitched battles with the cops. One person was killed and 70 others, including cops and journalists, were injured. On the morning of Monday, 22 May at Savar Export Processing Zone (EPZ), a suburb of Dhaka, workers at Universal Garments Limited gathered in front of the factory to demand payment of 3 months owed back wages. They were attacked by factory security staff. In response the workers went to neighboring factories and called out other garment workers for support. The growing group of workers then went from factory to factory calling on other workers to join them; 20,000 workers are reported to have joined this angry procession. By the afternoon hundreds of other factories in Savar EPZ and New EPZ had joined the strikes . Two factories were torched and 100s more ransacked, over 300 hundred company and management vehicles wrecked. The main roads going through Dhaka were blocked. Eventually the clashes with police escalated and the cops responded with bullets. The news of the escalation spread among the workplaces and drew out most other workers into participating. By Tuesday (23rd) the revolt spread to more factories as more workers were picketed out and the industrial areas of Dhaka were shut down by a generalised strike. Workers took the revolt from the industrial suburbs, where factories were now being looted, into the capital city itself, destroying cars and attacking commercial buildings. Mass demonstrations demanded an end to repression, release of arrested workers, higher minimum wages, weekly time off, overtime pay for extra work, public holidays, payment of wages due etc. (All these demands have since been agreed to.) Press photographers were attacked, roads were blocked and clashes with security forces continued. Thousands of strikers descended on factories, torching 4 and ransacking hundreds more. The Bangladesh Rifles were recalled from their normal duties as Border Control and deployed across the areas of unrest. By the evening 3,000 soldiers and armed cops were in occupation. On Wednesday (24th) things calmed down in face of the massive police/army presence. The bosses were showing signs of being willing to make some concessions, though still refusing to allow the right to organise trade unions. It is at present difficult to know if this is a demand voiced by the unions or if it has much support among workers themselves. Union leaders were brought in to negotiate a deal with the bosses. This was a breach of the garment bosses' longstanding opposition to union recognition; also a recognition of unions' useful potential role in containing struggle. Throughout June, clashes in the garment producing areas have continued, the main issues being victimisation of militants, back pay, non-implementation of previously agreed concessions. Strikes continually break out at individual factories, workers nearby stop work to join in the spontaneous demonstrations. Clashes with police, army and factory security continue, as do attacks on company property. Bosses have also sometimes locked out workers from factories when the breakdown in workplace discipline has become too explosive. At times whole EPZ areas are closed off by troops. This is made easier, once the workers have been driven out, as these industrial zones are fenced off and have their own checkpoints - complete with customs posts - due to their exceptional economic and tax status. The garment owners are dragging their feet in implementing the concessions, so workers remain continually in conflict with the bosses. The garment bosses have estimated their losses from the revolt so far at $70 million (and rising!) in a compensation claim submitted to the government. They have critcised the government's indecisiveness in dealing with the revolt.The BGMEA have demanded that a permanent industrial police force be set up to protect factory property in the event of future unrest. At present the Rapid Action Battalion, an armed police/paramilitary grouping is fulfilling this role. As the strikes at individual factories continue and often spread to neighbouring workplaces, the RAB are rushed in to attempt to disperse the angry crowds. But this does not encourage a return to work and invites sympathy and similar action from neighbouring workers. "The owners declared suspension of work at the apparel manufacturing units at Jamgorah, Zirabo and Ashulia in Savar on Tuesday amid an escalating labour unrest that left at least 100 people injured and 20 vehicles damaged. The crisis came to a head as workers of Irish Fashion started a furious demonstration in front of the garment factory over a rumoured murder of a co-worker on Monday night and closure of the factory for indefinite period since Tuesday morning. The angry workers went on the rampage, clashed with police and damaged about 20 vehicles, including two staff buses of a factory, during the mayhem.... Witnesses said following the Monday night's violence at Irish Fashion, hundreds of workers of the factory came to work at around 7:00am. But, they found a notice hung on the main gate saying the factory was closed for indefinite period. Enraged, the nearly 6,000 workers of the seven-storey factory immediately tore the notice into pieces, went on the warpath and started demonstrating. Fearing attack, police stationed inside the factory remained silent and did not come out to disperse the agitating workers. The mob pelted brickbats at and forced some other factories to close, and chanted slogans, urging workers of those plants to join forces with it. "The government agreed to release arrested workers and union officials, and to drop the cases against them. It also promised to set up a "minimum wage board for the garment sector and take steps to meet the demands of garment workers," and -- in a bow to the manufacturers -- to investigate the causes of the riots." So far, as unrest in the factories continues, the bosses are resisting agreeing to a minimum wage of Tk 3,000 - an average 30% wage rise. "The garment workers of Bangladesh may be the most deprived labor force in the world. Most are paid between US$14 to US$16 per month, the lowest salary in the world". - Amirul Haq Amin, Coordinator of the Bangladesh Garment Workers Unity Council (BGWUC), 2005. "I get Tk 900 [£7. 27/Eur10. 50/$13. 43] for a month of hard labour which is not enough to even cover my food bills,' said a worker at Tejgaon. 'Can you show me one worker who runs his family without a hitch with the money he gets?" - Sagar, who works in SS Sweater factory.
" In February 2005, the International Textile, Garment and Leather Workers' Federation found that the [official] monthly minimum wage for Bangladesh's garment workers was some $33 ten years ago, but that came down to $16 in real value due to devaluation of Bangladesh Taka against dollar. Helpers earn: 8 cents an hour; $3.64 a week/ $15.77 a month/ $189.28 a year. "The bourgeois media reports that the industry currently owes $US300,000 in back pay, a staggering amount considering the miserly wages." There are no guaranteed weekly days off, no holidays, no guaranteed maternity leave, no annual leave. Employment is also often insecure; workers change jobs frequently due to wage arrears, lay-offs, ill health or harassment from the bosses and their security guards. The workplace is a highly dangerous place in this industry: in February and March this year 2 fires killed over 100 workers and injured hundreds more, provoking strikes. As is common, most exit doors were locked, increasing casualties greatly. Also in February, a multi-storey factory collapsed: originally built as a 2 storey building, then over-extended, 19 workers were killed and around 50 injured. Thousands of workers have died from employers' neglect of safety procedures. In the generally stagnant economy of Bangladesh, the ready made garment sector is the only significant economic force. This sector is entirely export oriented and is composed of over 5000 units - most working for international buyers, some owned by international companies. Most of the garment units are clustered in industrial areas and EPZs in and around Dhaka - Ghazipor, Savar, Ashulia, Mirpur, Tejgaon, Mohakhali, Uttara, Wari and Tongi etc. This is the modern face of 'Globalisation'. Capital goes where there is surplus labour to be had cheapest, installs its plant machinery and begins to extract profits. Equally, local capital sees an opportunity to utilise cheap local labour for the global market. In 1978 the Bangladesh government set up Export Processing Zones (EPZs) to attract foreign capital and earn export dollars. (100% foreign ownership, 65%; joint venture, 13%; 100% local venture, 22%.) 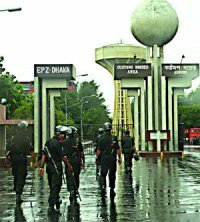 In 1993 the Bangladesh Export Processing Zone Authority (BEPZA) was set up and a blanket ban on trade union activity imposed. An attractive investment location for investors, also including tax breaks and other incentives. The EPZs now employ 70,000 workers, mostly in the garment and shoe-making industries (though most of the garment industry exists outside the EPZs). National labour laws do not apply in the EPZs, leaving BEPZA in full control over work conditions, wages and benefits. The garment industry is the life blood of the Bangladesh economy. Garment factories in Bangladesh provide employment to 40 percent of industrial workers. More than three-quarters of the $7.8 billion of Bangladesh's export earnings comes from exporting garments. Despite falling prices, export volume has grown, and business is booming at present as the Bangladesh garment industry takes advantage of comparitively cheaper labour costs and World Trade Organization restrictions put on China, the world's largest Ready Made Garment (RMG) exporter. Bangladesh RMG imports to the US have increased 25% this year so far. "Dhaka raised the issue that most of these countries rely heavily on the export earnings of textiles and apparel which are subjected to some of the highest US tariffs, averaging 17 percent. "Any debacle in the apparel industry would lead to massive unemployment of women, creating economic and social instability, and have other possible ramifications," the Ambassador said, conveying his country's apprehension to his American audience. The implication being that lucrative duty-free access to the American market will encourage social conditions that lessen the possibility of a rise in Islamic fundamentalism. It is true that the so far limited emergence of fundamentalism in Dhaka has led to attacks on unions for their attempts to organise the predominantly female RMG workforce. Most of the garment workers have migrated from the poorest rural areas into the city slums. The slum population of Dhaka has doubled in the last 10 years. "More than 90 per cent of the slum dwellers have income below poverty line, which is Tk 5,000 a month a household. The dwellers are mostly transport workers, day labourers, garment workers, small vendors, hawkers and domestic helps..." (New Age.) It is this wider community that joined in the clashes and rioted with the garment workers. Though there are 16 unions representing garment workers, according to the Democratic Workers Party "...the level of unionisation among workers is very low. Where unions are involved, they act more like extortionists, taking money from management to keep the employees in line while at the same time collecting dues from their members, with whom they have virtually no contact. Most of the unions have direct or indirect links with local and foreign NGOs, and receiving lucrative grants seems to be their main goal." Though organising trade unions was banned by employers in the EPZs, this is changing, as one of the concessions won by the revolt. This is anyway a convenient concession for the bosses; a Bill is being introduced into the US Senate which, if passed, would ban all imports produced in sweatshops. This is a form of US trade protectionism and corporate image management expressed as concern for workers' conditions. The Bill would penalise Bangladesh, Jordan etc and America's big rival China in, for example, the garment industry, by attempting to undercut their present advantage of cheaper labour costs. As well as the dire conditions of employment, the low level of unionism is one likely reason for the ferocity of the workers response. When it erupts, unmediated class war is generally conducted more brutally on both sides. The Bangladesh state finally realised this when it brought in union officials to mediate and negotiate an end to the rebellion. In the long term, union representation is usually granted by the bosses as a necessary safety valve mechanism and tool of management for the stability of the production process. Some commentators, from the bourgeois media to the ultra-left, have considered the working class's use of riot as a sign of organisational weakness. On the contrary, we see their use of riot and fire as brave and intelligent in a situation where they faced brutal repression by a determined body of employers and the armed forces of the state. Property damage combined with withdrawal of labour is a time-honoured tactic of proletarians. Rioting also opens up an opportunity for the wider working class community to become involved in the struggle and immediately spread the perspective beyond isolated sectional activity. When the cops and army invade workers' living areas it is anyway inevitable that the neighbourhood is drawn into the struggle. The extensive use of this tactic is also an inspiring example of effective collective self-organisation that, for the garment workers, has been far more successful than all previous struggles. The workers' revolt led to a sharp drop in share prices as international investors panicked at reports of a 'workers' insurrection' in the garment industry. At a meeting between the garment owners and the major international buyers (Gap, Walmart, Asda, Carrefour etc) on June 29th, they were criticised for their handling of labour relations. The bosses responded by saying that the agreed concessions such as wage rises would be passed on to the buyers and retailers abroad. One buyer's representative, claiming fake indignation at low wages in the industry, (which never captured their interest till now when it jeopardised smooth supply and cheap price) replied by asking; why had wages not risen in 12 years when prices had? (In the same period the cost of living for workers had doubled.) " First Secretary and Chief Economic and Commercial Officer of the US Embassy in Bangladesh David W Renz said it was not enough to just increase the workers wages. "Improving the competitiveness is vital to compete in the global market." "Meaning: claw back the wage increases by pushing for higher productivity. The ruling class in Bangladesh should be worried by this expression of workers' power - a major revolt forcing major concessions in the only significant export industry. Some Western analysts are already classifying the country as 'a failing state' and it is rated as the most corrupt in the world (in whatever way the ruling class calculates such things). This is causing international concern at the potential destabilising influence on the region. "The geopolitical significance of the riots lies in the fact that they reveal the weakness of the Bangladeshi state. The failure of the government to contain the violence quickly and opting instead for half measures that satisfied neither side and did nothing to bring them to an agreement points to an implosion of governability and indicates that Bangladesh is drifting toward the status of a failed state. This has implications for the stability of the South Asian region." (pinr.com) The political system in Bangladesh is a vicious mess of instability and regular political assassinations. There is no cohesion within the ruling class, only warring factions perpetuating an economically and politically vulnerable state. For capital, the competition in the global RMG sector grows fiercer. Upward wage pressure, such as the Dhaka revolt expressed, will lead to demands for greater productivity to compete with those countries that have managed to keep the lid on wage demands. Competition for a bigger share of the market will cause market saturation and price drops. The possibility of new regulations outlawing or regulating sweatshop conditions by western buyer countries, as a form of protectionism and to ease concerns about corporate image, is another factor, as is import quota restriction by both the EU and US. The neo-liberal globalising project has exported new forms of trade and production and, consequently, new forms of class struggle. By the evidence of press photographs, the majority of demonstrators were male. There have been some pictures showing female demonstrators, but the insufficient eveidence gives an impression that the activity on the streets is predominantly male, even though 90% of garment workers are female. "After the end of the Multi-Fiber Agreement at the beginning of 2005 and the changeover to the new World Trade Organization regime, it was feared that the Bangladesh's booming textile industry would suffer as it would loose business to countries like China and India. But fortunately for Bangladesh, so far this prediction has been proved wrong. In fact, the industry has continued to grow at a healthy rate of 20 percent. However, this does not indicate that the Bangladesh garment industry has become more competitive. The reality is that this increase has been largely due to restrictions imposed on China by the Western nations than to the ingenuity in Dhaka or Chittagong. The Chinese cannot be held back after 2008, which means a completely different picture might emerge after that. The Bangladeshi Trotskyist Democratic Workers Party describes the BGWUC as a collection of "sham unions" (though whether this description is motivated as much by political rivalry as political clarity is uncertain). "On 3 May, garment workers and supporters staged a peaceful protest against a sudden wage cut in the Savar EPZ, 50 km north of the capital Dhaka. The management of Ring Shine called in the police, who attacked the 1500 strong gathering. One knitting operator, Rafiqul Islam, and one supporter, Mosharaf, were shot dead and 200 injured. Outraged demonstrators ransacked the factory in revenge. Six people were arrested, and a further 80 face charges of property damage. Those left and ultra-leftist 'marxists' who routinely dismiss rioting as a valid form of working class struggle (yet still slavishly take Marx's word on everything as gospel) ignore the fact that Marx himself participated enthusiastically in three 1855 riots of the London proletariat during mass demonstrations against proposals to restrict pub opening times. On successive Sundays working class demonstrators streamed out of Hyde Park into nearby rich areas such as Belgravia, rioting and assaulting the rich and their property. According to his companion, Liebknecht, Marx came close to being arrested. Marx later wrote, "We saw it from beginning to end and do not think it an exaggeration to say the English revolution began in Hyde Park yesterday." (Unfortunately, it was an exaggeration.) So despite what moralistic ultra-leftists and bourgeois alike may say, Marx clearly saw rioting as a radical weapon of the proletariat. http://www.newagebd.com/front.html#3 - New Age, a Dhaka-based daily paper, has been the most detailed mainstream media source on the recent unrest.